Khosrau II was only twenty years old when he became king in 590 AD. 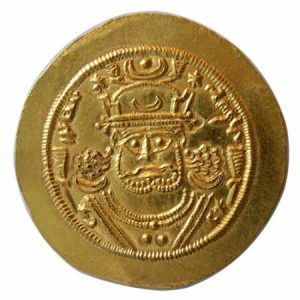 Probably the powerful Sassanian families – particularly his mother’s brothers – thought he would be easier to push around than his father had been. In order to defeat other candidates, Khosrau needed help from the Byzantine army. The Roman emperor Maurice agreed to give that help in exchange for a lot of rich land in Armenia, western Iraq, and Syria, and not having to make any more payments to the Sassanians. But that made the Sassanian Empire poorer than it had been before. 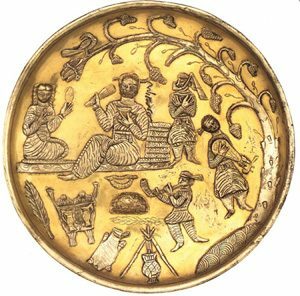 Khosrau’s uncles ran the kingdom for a few years, but by 596 or so Khosrau succeeded in killing both of them so he could rule on his own. His kingdom had a reputation for great music – possibly because they were using the new bowed instruments. Khosrau married a Christian woman, Sirin, and encouraged Christianity, including the Nestorians, probably in order to get along with the Romans and to reduce the power of the Zoroastrian priests. After Maurice died in 602, the Roman emperor Heraclius seized even more land in Iraq from Khosrau II. But by 613 AD, Khosrau’s generals were pushing back, taking Jerusalem and even threatening Constantinople. They got the Avars to help them by attacking Rome in the north. Khosrau’s plan seems to have been to wipe out the Roman Empire and unite all of West Asia in the fight against the invading Gokturks and the White Huns. But in the end, the powerful families were too much for Khosrau. They rose up in rebellion and killed him in 627 AD. The families put Khosrau’s powerless son on the throne as their puppet. When Khosrau II died, the Sassanian Empire fell back into civil war. Five years later, the armies of Islam invaded from the south, and swept over the Empire, pulling it into the new Umayyad Empire. Did you find out what you wanted to know about the end of the Sassanian Empire? Let us know in the comments! Ancient Persia, by Don Nardo (2003). For kids, good for reports. Parthian Art, by Malcolm Colledge (1977). Not very easy to get anymore, but it’s the classic book for the Parthians – it has a lot more than just the art. Ancient Persia, by Josef Wiesehofer (2001). Includes the Parthians and the Sassanians. Sasanian Society: Warriors, Scribes, Dehqans, by A. Tafazzoli (2000). An Iranian perspective. The Cambridge History of Iran: Volume 3, The Seleucid, Parthian and Sasanid Periods, Part 2: Seleucid Parthian, edited by E. Yarshater (reprinted 1983). Expensive but complete. Cite this page: Carr, K.E. Khosrau II and the end of the Sassanian Empire. Quatr.us Study Guides, March 21, 2018. Web. April 23, 2019.